The Karate Kid falls under the same category as previous project entry, Who Framed Roger Rabbit, in that I’m sure I saw at least a good chunk of the movie as a kid. Once again, I remembered a scene here or there (who can forget “wax on, wax off”?) but it was fascinating to sit down and watch it in its entirety as an adult. While the fashion and spirit of the 1980s are running wild in the film, I’m happy to report that it still holds up quite well as a fun, inspirational movie. When New Jersey high school senior Daniel LaRusso (Ralph Macchio) is forced to move across the country with his mother to Los Angeles, he has a hard time adjusting to his new environment. 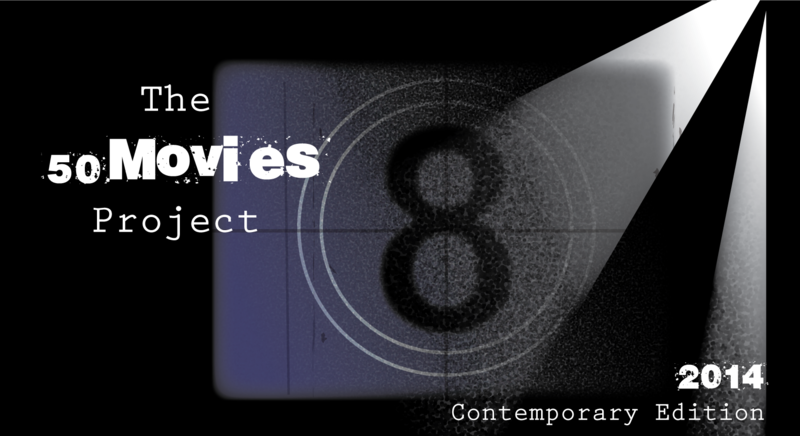 Things seem promising at first — he befriends a local neighbor and meets a cute girl named Ali (Elisabeth Shue) — but he also acquires a handful of unwanted enemies. Johnny Lawrence (William Zabka), Ali’s ex-boyfriend, and his gang of karate thugs beat down Daniel and leave him face down in the sand. When Daniel refuses to back down later on, they continue to bully him whenever possible. It isn’t until Daniel meets his apartment complex’s maintenance man, Mr. Miyagi (Pat Morita), that things start looking up. 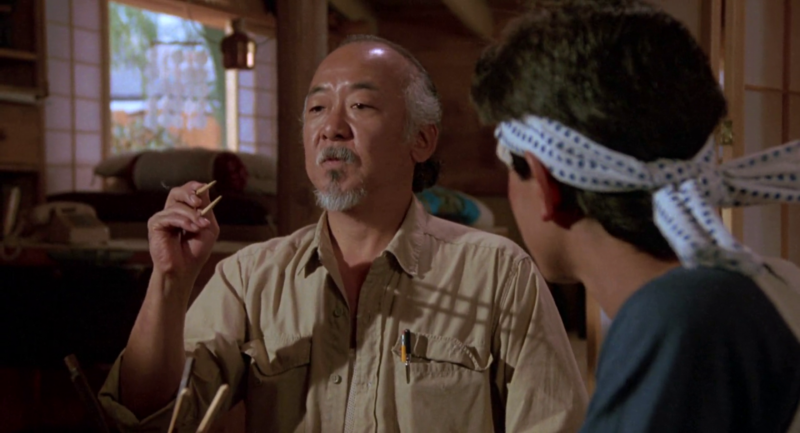 He discovers that Miyagi is proficient in karate, and he begins training under his guidance. The training regime isn’t quite what Daniel expects, however. Miyagi has him perform tedious chores such as waxing his cars and painting his house. It’s not all for naught — these unorthodox behaviors improve his muscle memory, leading to him becoming quite the defensive expert. As a way to put an end to the bullying, Daniel enters a karate tournament in hope of taking down Johnny and his friends once and for all. This setup is ripe for a cheesy, feel-good story, and that’s exactly what The Karate Kid is all about. There are music montages — most notably, the unforgettable “You’re the Best” during the tournament — and budding romances, and all of that goofy stuff you would expect to see from a movie of this sort. What makes the film really work is the performance of Pat Morita. His take as the wise and reserved Mr. Miyagi got him an Oscar nomination, and it’s easy to see why. He comes across as such a likable mentor, and he’s someone that I’m sure every kid wishes he knew growing up. Sure, The Karate Kid might be “Rocky for kids” (the two films even share the same director in John G. Avildsen) and it might be a little too long, but it remains a solid piece of family-friendly fun that still entertains to this day. I remember seeing this in the theaters when I was a kid, and then continually renting it to the point of overkill when it was released on VHS. It also made every kid in our neighborhood (including myself) to take up martial arts. Then something else came along that made us forget about it after a while. Good stuff. 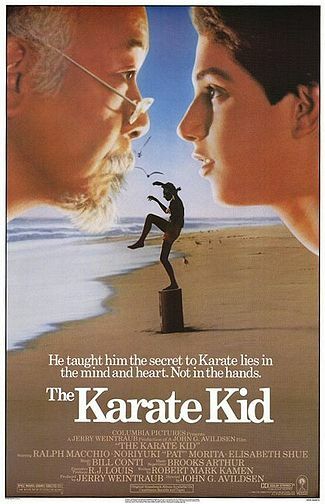 I could see this film having a huge impact on karate schools back then. Agreed. It was nice to see Ali stick with Daniel through both the ups and downs, and not just fall in love with him because he won a karate tournament. Kind of bucks the trend there a bit. 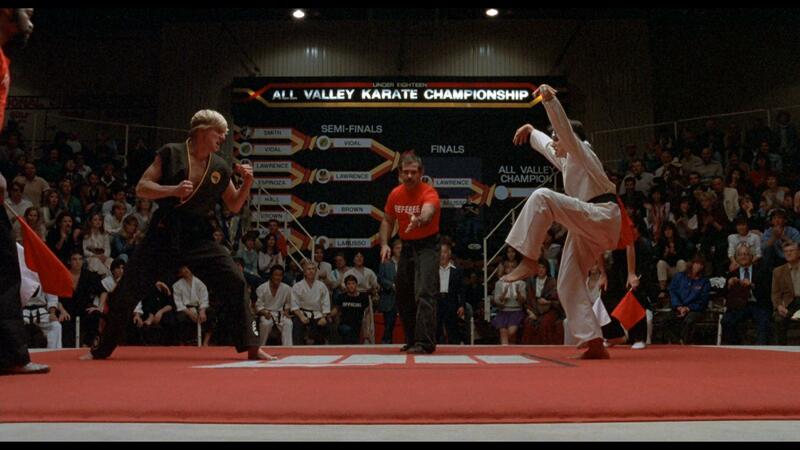 I’m amazed by how well The Karate Kid holds up today. I totally agree that Morita does a great job. There’s one scene that’s hardly remembered by many where Daniel catches him drunk, and we see the sadness behind the character. I get sucked into the tournament every time. That’s a great scene to point out, Dan. It was really the only glimpse we got into Miyagi’s past, but it was very effective. I also got to this one late as an adult. I was entertained, just I was expecting the wisdom and lessons of the teacher to be more profound, considering the reputation the film has, then again it’s only a kid’s movie. My expectations were fairly low so I ended up enjoying this more than I thought. I wonder if the remake is even half as entertaining or effective as this one. I agree, this is one damn entertaining flick, and Morita is excellent in it. The final tournament is a great little set piece. I fell in love with the final tournament as soon as “You’re the Best” kicked on. 😀 Definitely a fun movie. I really wonder how a person from east Asia perceives this film. I also wonder if the character of Mr. Miyagi is a tad too…I don’t know…cartoonish, which to some may be insulting of the culture. However, if it is taken lightly, as it was intended, then Karate Kid is exactly what you suggest, a very entertaining and family friendly film that is a clear product of the 1980s. Thanks, Niels. You know, I was wondering the same thing regarding the Miyagi character. I think in the wrong hands it could have been a bit of an embarrassment, but Morita brought some class to the role. He really helped elevate the film overall, and his performance is the biggest reason it’s still so enjoyable today. This movie was huge when I was growing up. I really enjoyed it then but I haven’t had the desire to watch it again for some reason. Funny but even seeing Ralph Macchio recently at a local comic-con I sort of cringed, I don’t know why! In any case, it’s a great story and Mr. Miyagi is practically iconic! Hahah, that’s funny about Macchio. This seems like one of those movies that is worth stopping and watching at least part of if it’s on TV, but I don’t think I would go out of my way to rewatch it anytime soon. Again, agreed. A fun ride, even if it isn’t earth-shattering. I never before realized this has the same director as Rocky. Interesting. It is really a superb inspiration film.